Free Printable PLACE VALUE Worksheets. Quiz online or print. Free Printable Place Value Worksheets. Understanding place value is the building block to working with numbers. 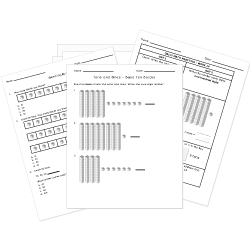 From thousands to thousandths, use these worksheets to develop place value skills. Don't see a printable you need? Use our Test Maker™ to create your own printable that fits your needs. Browse place value questions or use our advanced search to find existing questions while filtering by grade levels and keywords. You can also create your own questions.